Zoe and Ana are constantly drawing and writing... so there are always pieces of paper everywhere. I really love the random art that shows up around our house. I'm always happy to find the little love notes, hearts, smiley faces, flowers... the normal "girly" art. But my favorites? Those have to be the ones that make me wonder where in the world their little brains have been. 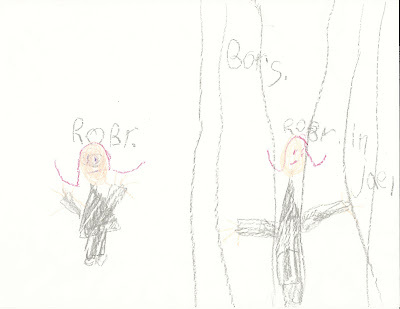 I can't quite figure out what had Zoe thinking of robbers and robbers behind bars in jail... but this is my current favorite piece of Art.